A display device is an output device for presentation of information in visual or tactile form (the latter used for example in tactile electronic displays for blind people). When the input information that is supplied has an electrical signal the display is called an electronic display. 2-dimensional displays that cover a full area (usually a rectangle) are also called video displays, since it is the main modality of presenting video. 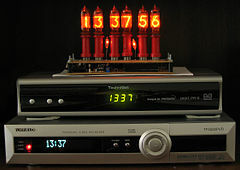 The multiplexed display technique is used to drive most display devices. Tactile electronic displays are usually intended for the blind. They use electro-mechanical parts to dynamically update a tactile image (usually of text) so that the image may be felt by the fingers. Optacon, using metal rods instead of light in order to convey images to blind people by tactile sensation. ^ Lemley, Linda. "Chapter 6: Output". Discovering Computers. University of West Florida. Archived from the original on 14 June 2012. Retrieved 3 June 2012. ^ "Accommodations For Vision Disabilities". Energy.gov. Office of the Chief information Officer. Archived from the original on 9 June 2012. Retrieved 3 June 2012. University of Waterloo Stratford Campus - A university that offers students the opportunity to display their work on the school's 3-storey Christie MicroTile wall.